Our brass type is made to the most rigorous standards from the same hard brass used for our other tools. The body is first machined to the exact point size and then ground accurately to the type height. 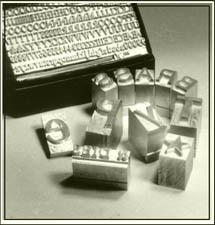 The characters are deeply engraved using special jigs to ensure perfect alignment and excellent definition on most surfaces, when used either by hand in a typeholder, or in a blocking press. Our range of faces have been gradually increased and now includes 60 styles, which are shown on the following pages. To conserve space we now show a complete alphabet of each face followed by an example of each point size available, with the actual height shown in mms, (larger or smaller point sizes are available in a limited number of styles, please enquire). 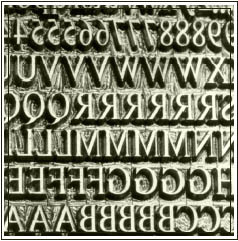 The names of some of the type faces have been ‘invented’ as they were reproduced from founders cast brass type, the names of them long forgotten. The style sheets have been arranged for ease of comparison with sans serif faces first, followed by light serif faces, then Roman faces. Finally the scripts, decorative faces and foreign language fonts. Most faces are also available with accented letters for foreign languages (please supply details of requirements). Where frequently used words or phrases are required, dies can be supplied. An index of type styles can be found at the back of the catalogue.